Key signatures are about finding and playing the correct black and white notes for a given key. There are a number of ways to approach learning them. 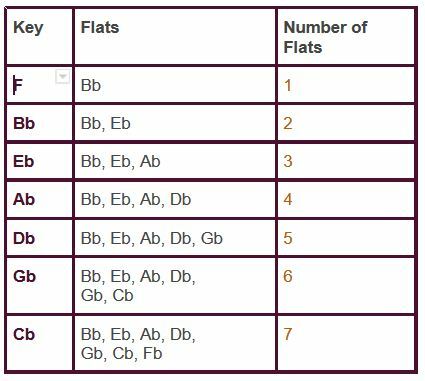 Here's a short video explanation of key signatures. If it's confusing, read the information below first. Then try the video again. There are keys with sharps and keys with flats. They can only be one or the other. 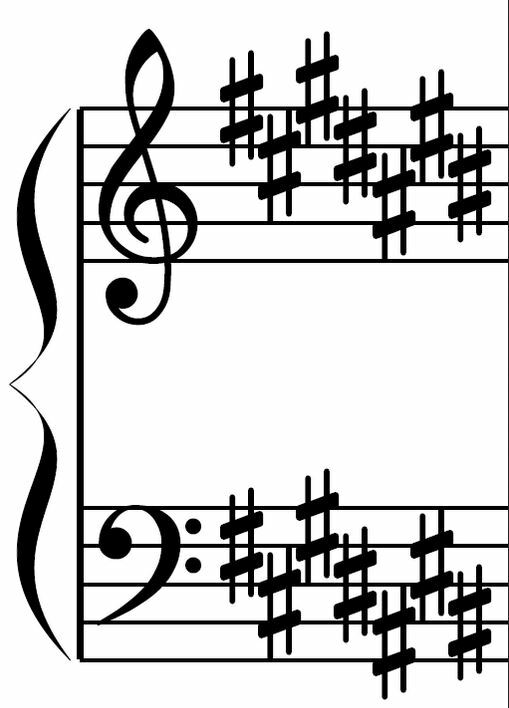 Most of the time the sharps or flats are black notes. If a note has a sharp or flat in a key, for example, F#, then you must always play F#. Don't play F.
The only key with no sharps or flats is C. From C, we can figure out the rest of the keys. Start with the note C. To figure out which note has 1 sharp, count up 5 notes (including C). Now you are on G. It has 1 sharp - F#. Notice that F# is the note directly in front of G. So, the key of G has one sharp which is F#. Now, all keys that have sharps in them will include an F#. If there are 2 sharps, they will be F# and something else. To figure out which key has 2 sharps, count up 5 from G. It's D. The note directly in front on D is C#. So, D major has F# and C#. 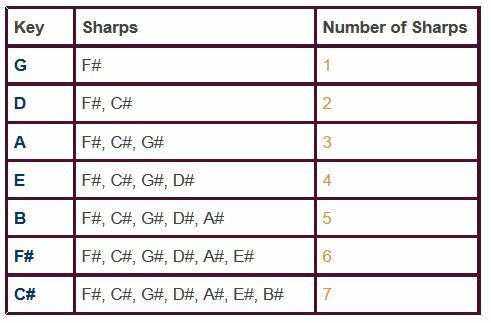 Here's a chart of the keys and the notes that are sharp. The keys with flats follow a different pattern. You count in 4's. Starting from C, count up 4 (starting on C). Now you are on F. F is the key with 1 flat. To find the flat, count up 4. You are on B. Now make the B a flat. 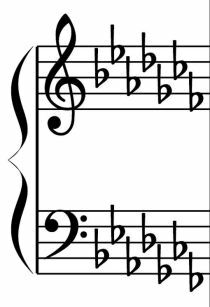 The key signature of F is Bb. Bb is also next in line. Bb is the key signature with 2 flats. Count up 4 and you are on Eb. 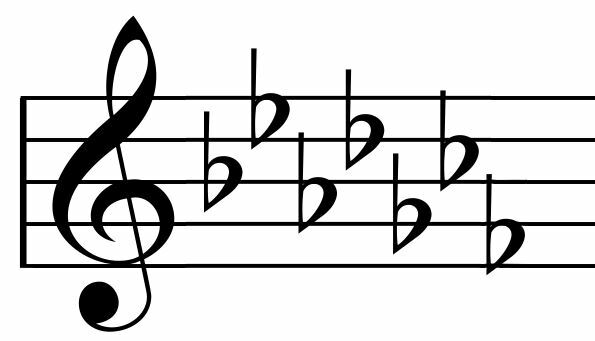 The key signature of Bb is Bb and Eb. And the pattern continues. I don't use a saying for the flat keys but the first 4 spell the word "bead". After that I just remember "g-c-f". 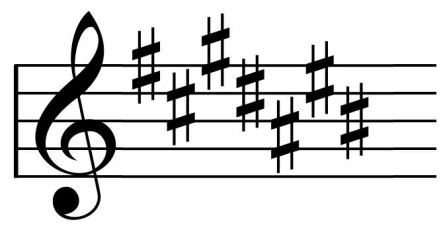 If you need to write the keys on the staff, here's how they should look in piano music. Return from Key Signatures to Piano Lessons Info Homepage.